Today’s economy is built on the foundations of a global industrial and financial system with immense productive capacity, but the extractive nature of which has created extreme income disparity and social injustice and wrought devastation on the natural world. There is an increasingly spirited debate about the need for a ‘new economy’, which has fertile and important implications for the legal and philosophical foundations of the current system. Join us for a timely discussion about what types of future economic systems we want to build in Australia. Our two day conference will bring together community activists, social entrepreneurs, economists, indigenous leaders, academics, lawyers and regulators, to discuss, showcase and weave together the explosion of experiments that are bubbling up around peer-to-peer initiatives, commoning, maker movements, sharing, buen vivir, collaborative economies, solidarity economies, localisation and cooperative movements. Over two days, we will tease out the connections and conflicts between these movements, with an eye to the practical lessons for projects and politics. 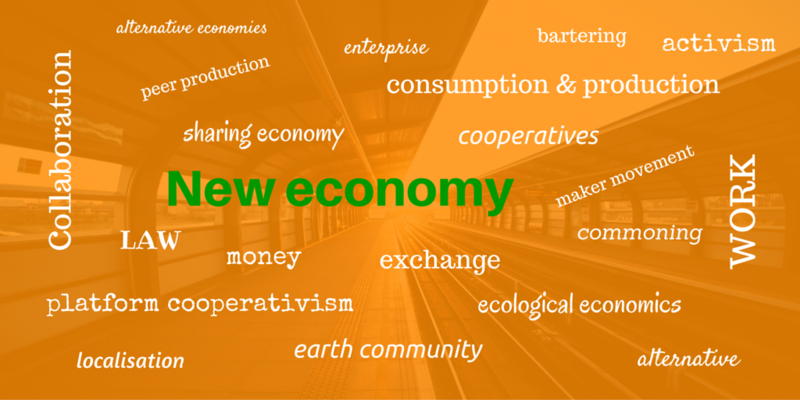 We will ask: What are different visions of the ‘new economy’ and how achievable are they? What possibilities exist at their intersection? How can we reimagine work, exchange, money, care, law and our relationship with the natural world through the prism of a new economy? The conference will include an interactive plenary session on Day 2, which will enable interested participants to co-design a Charter for a Coalition for a New Economy. Copyright © 2019, New Economy Conference 2016.